This page guides you through updates in recent dotCover versions. 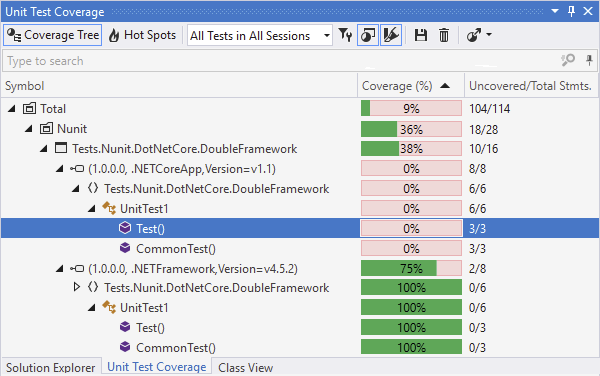 Highlights include more options for code coverage highlighting, continuous testing for a lot faster unit test feedback, support for Visual Studio / JetBrains Rider and .NET Core. Now, there are two groups of filters in the dotCover options: runtime filters (applied during a coverage session) and results filters (applied to coverage results after the session is over). 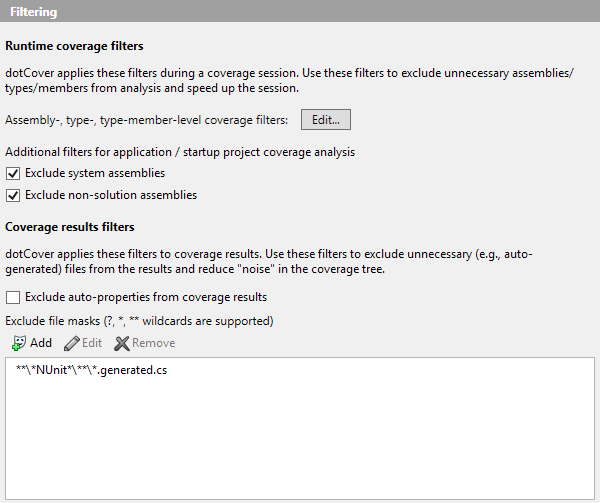 Coverage results filters get an additional filter by file name. Now, if a project targets multiple frameworks, the Coverage Tree will show results separately for each framework (each framework will be shown as a separate node in the tree). Code highlighting also depends on context selected in the editor. 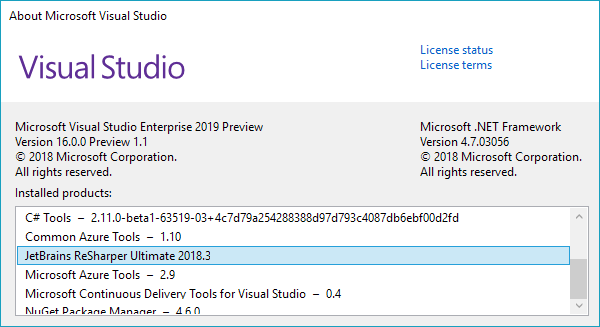 dotCover 2018.3, along with other products of the ReSharper Ultimate family, can now be installed into Visual Studio 2019 Preview 1. In addition to Visual Studio, now dotCover is a part of the JetBrains Rider IDE on Windows. In this release, there are two main features supported: code coverage analysis of unit tests and continuous testing. To learn more, see Unit test coverage and continuous testing. Now in Rider! 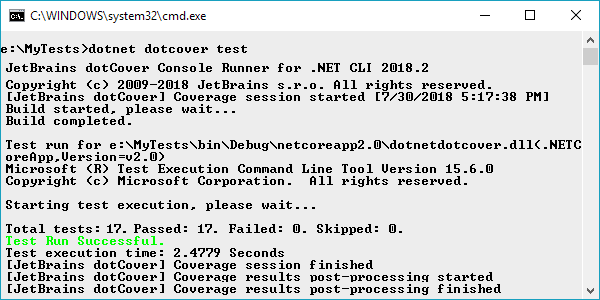 Moreover, the "classic" dotCover.exe console runner also gets improved. Now, you should not choose between the analyze and cover commands: always use cover. The coverage result will depend only on the --ReportType argument: if it is specified, you'll get a report of a certain type; if not, a regular coverage snapshot will be saved. No more separate continuous testing session! Continuous testing mode can be turned on for any unit test session. In dotCover 2017.3 and earlier, your continuous testing scope was limited by a single continuous testing session. Now, you can have as many scopes for continuous testing as you need. Moreover, in dotCover 2017.3, you had no alternatives on how tests were auto-started during continuous testing. After you build or save your solution, dotCover started tests under coverage. In 2018.1, coverage is no longer necessary: you can tell dotCover to simply run new and outdated tests (without covering them). This could be a great time saver if you already have an up-to-date coverage snapshot. To learn more, see Better continuous testing and more! Coverage information is now shown in a separate Unit Test Coverage window instead of a per-session Coverage tab. The positive effect of this decision is the ability to see aggregated coverage data for all unit test sessions in one place. To learn more, see Analyzing code coverage of web apps. 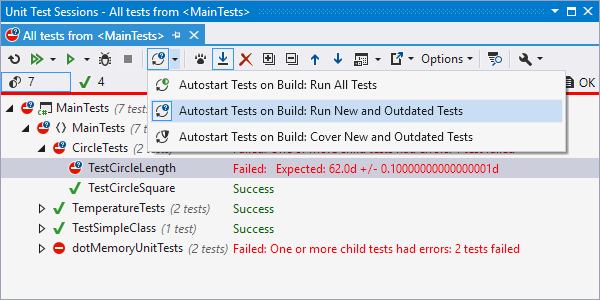 Now, NUnit and xUnit unit tests targeting .NET Core are fully supported in the continuous testing mode. The "shield" icon in the right gutter of the Visual Studio editor allows you to quickly view total coverage percentage and the number of failed tests for code in the currently opened file. Clicking on the icon navigates you through the uncovered statements. Before 2017.3, after you used Show Covering Tests (Ctrl+Alt+K T) in the editor, the popup window showed you a list of covering tests but contained no info about what exact part of your code is covered by these tests: a class, a method, or a particular statement. Now, the popup tells this explicitly and even highlights covered statements in the editor. Showing tests that cover a particular location in code. Improved performance. Before 2017.2, working with continuous testing on large solutions was a real pain: while test execution was fast, subsequent coverage analysis could take up to several minutes. The problem is addressed in dotCover 2017.2: due to a new snapshot format, dotCover can now process coverage results much faster. When viewing coverage results of a particular unit test session, you can now merge them with coverage data from a snapshot. dotCover's highlighting markers can now indicate coverage and test results not only with color but also with their shape. Old-style highlighting is back again and it's better than before! Since the new highlighting style (using markers) may not be a good fit for all use cases, we've added an option to switch between markers and colored background or to display both. The old highlighting style also supports the updated logic and displays both tests coverage and test results.